Elmore County 79.5 +/- acres – SOLD! John Matulia just closed on this property today, thankful for the opportunity to represent the seller on this tract! –This is a beautiful hunting, recreation and homes-site property in Elmore County, Alabama, on Knox Lane. The property is located near Firetower Rd in the Redland, Wetumpka area. This tract makes for a perfect home-site for those desiring to live on acreage and still be close to Wetumpka and Montgomery. The property also features great hunting, including: deer, turkey and duck hunting. This 79.5 acres is currently planted loblolly pines (approximately 20 years old) and has nice creeks and hardwood SMZ’s that divide the property nicely. 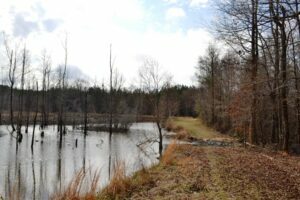 There is a good road system on this property and a really nice duck pond, that is ready for duck season.